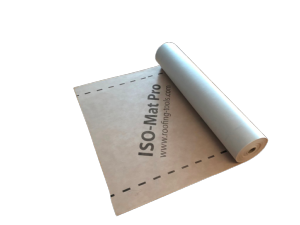 ISO-Mat Pro is a high performance breather membrane and underlay suitable for all types of domestic and commercial buildings. ISO-Mat Pro is used in rooifng & cladding applications under ightly fitted metals installed in cold ventilated construction and is suitable as an underlay in all UK wind zones as described in BS 5534. Avaiable in 50m x 1m rolls.